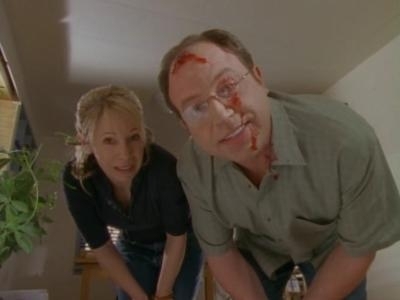 CPE & Em: Corner Gas, Episode 4: Oh Baby! A brief synopsis – Wanda has a toothache, and Brent, trying to impress Lacey, volunteers to watch her kid. The town takes bets on what will happen while Oscar fills in at the store. The best line – Oscar: Sure you can trick a kid. Kid’s are stupid. Brent: Well, your days of outwitting 7 year olds are over. Thankfully, now it’s illegal for kids to smoke. Oscar: What? Since when? (Turns to Officer Davis, who is reading a magazine) Is it illegal for kids to smoke? Davis (not bothering to look up): What am I, a lawyer? The best moment – Emma catches the car. The best storyline – Oscar in charge of anything is a hoot. Notable guest appearance – We see the Mayor, Fitzy, for the first time, played by Cavan Cunningham. Em’s Favorite Character – Emma because she came to the rescue. A solid episode, even if it is not the most original story lines. The characters are finding their places in the show and becoming comfortable interacting. That said, it is worthy to note that they show Brent having an interest in Lacey for the first time. This is a theme they will approach tepidly throughout the rest of the season. It is also one of the few times that we will ever hear any reference to Wanda’s kid.